Purports to be quieter, easier to maneuver, and more environmentally friendly than existing craft. Frustrated with what they see as stagnation in the evolution of hovercraft design over recent decades, cousins Michael Mercier and Chris Jones have teamed up in an effort to bring the personal hovercraft into the 21st century. 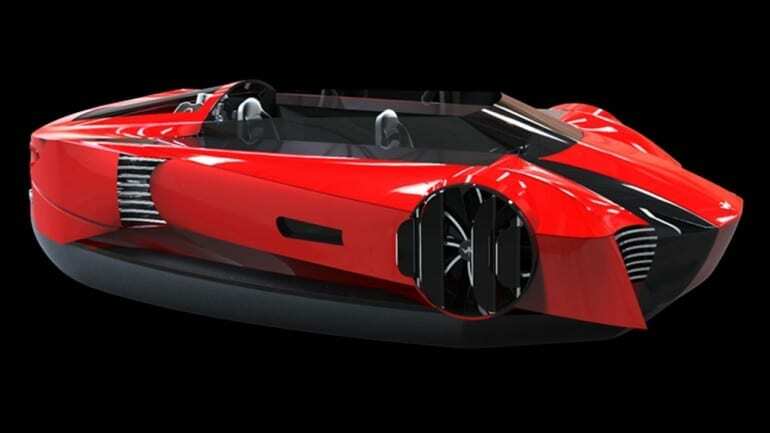 As well as a futuristic, streamlined look inspired by high-end sports cars, the Mercier-Jones concept also purports to be quieter, easier to maneuver, and more environmentally friendly than existing craft. Maneuverability – or lack thereof – has always been one of the big downsides of hovercraft, but the Mercier-Jones team claim their patent-pending directional control system will enable steering and braking ability similar to that of a car. The front, side-mounted fans are said to provide fine tuned control in forward, lateral and reverse directions, with independent control over each side enabling advanced maneuvering capabilities. Taking inspiration from the marine, automotive and aerospace industries, the hovercraft will be constructed using lightweight materials including carbon fiber, aluminum, fiberglass and marine plywood. But by using existing technologies and fabrication methods, they aim to price their entry-level hovercraft at under US$20,000.